Owning a Volvo, you are aware of how exhilarating it is to drive a new Volvo vehicle. Now, you can feel that excitement all over again with the Volvo Loyalty Bonus Offer. With the Volvo Loyalty Bonus, anyone who owns or leases a Volvo gets 1% off their rate for the next lease or purchase of a qualifying new Volvo*! *Offer not available on the 2018-19 Volvo XC90. Owner Loyalty Bonus available only to Volvo Car of Canada Customers. 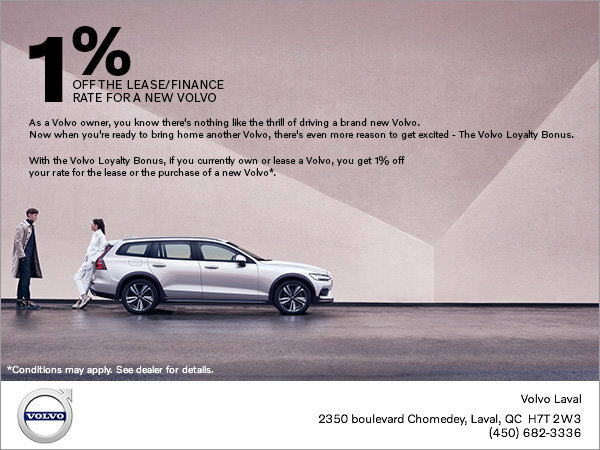 Loyalty Bonus is 1% off the rate for the lease or a purchase of a qualifying new Volvo. Customer eligibility requirements must be met for Loyalty Bonus offer. Please see retailer for details. Individuals who currently own or lease a Volvo are eligible. Offer is not transferable. Offer only available on purchases or leases of qualifying new Volvo vehicles. Household address must be the same as that listed on the existing Volvo ownership registration (this is intended for self, spouse, parents and children within the same household only). Loyalty bonus must be claimed within 60 days of the existing lease terminating or trade-in of a purchased Volvo. Customer must provide a copy of the 'outgoing' or existing vehicle registration. Offer cannot be used toward the payment of sales tax. This offer is subject to taxes. Offer cannot be applied to vehicles purchased as used and/or Overseas Delivery (VCIC) program sales.